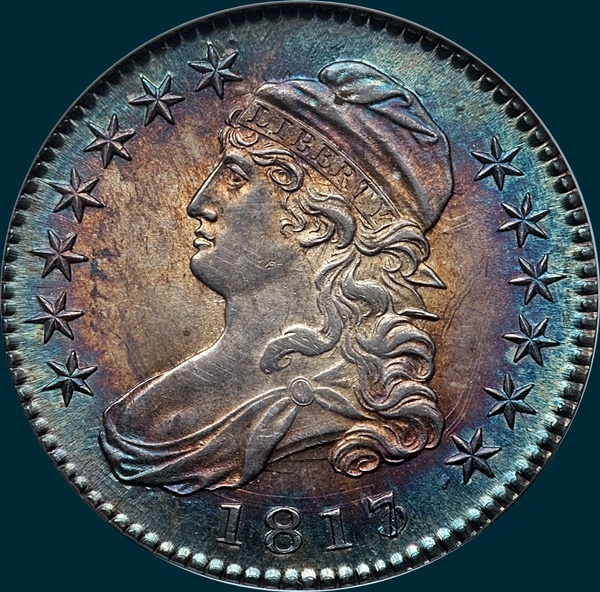 The most pronounced overdate of the Capped Bust series. There are plenty of these that have survived, with the later die state being more common, but demand is such that this overdate is quite valueable, especially in XF grades and above. The finest of this marriage is a single MS66, but there are several other MS examples at the top of the census. 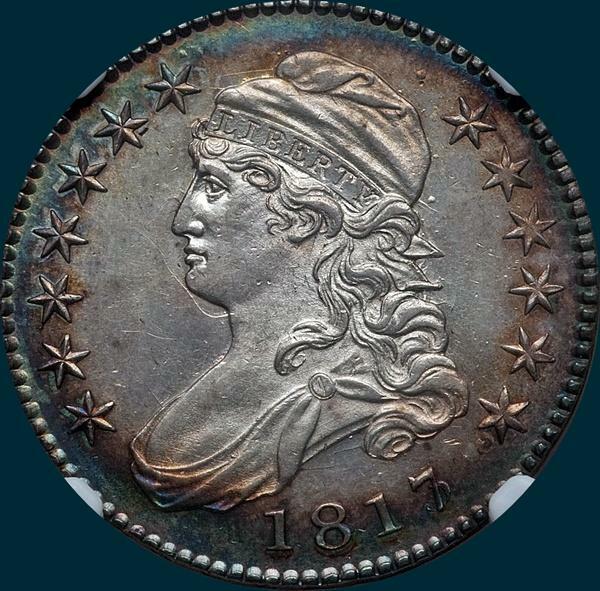 Variety Attribution: Obverse- 1817 over 13. Stars are sharp. Date is 9 mm. and evenly spaced. The 3 is sharp below the 7. The great majority show several pronounced die lumps. One below star 13, others at back and above cap and above star 7. There are a few specimens, however, that do not show these die peculiarities. Reverse- 50 C. is 1 3/4 mm. Arrow to A slightly over 1/2 mm. Right sides of T-I in line. Most specimens exhibit several die lumps, a large one inside 0 of 50. Also around 50 C. and olive leaves. 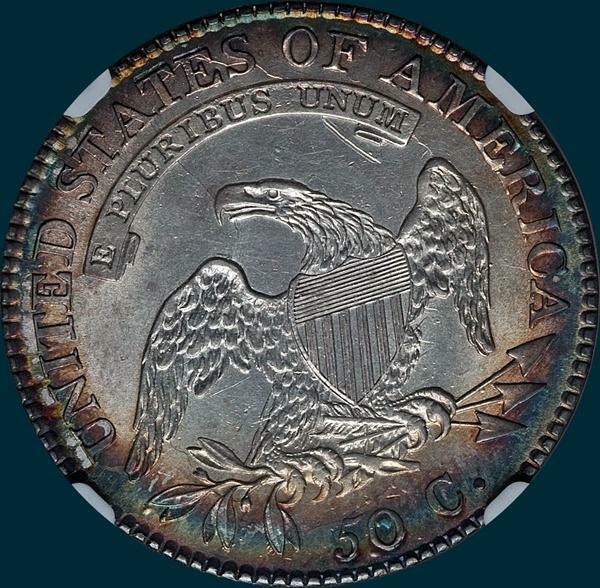 However, they are usually absent on those that do not show the obverse lumps. Center dot between crossbars 4 and 5. O-101a: Die crack from edge above M down across ME, tip of right wing, claw, arrowshafts, and top of 50, then across tip of olive leaf to edge. Late states also show a fine crack from leaves through UN and to edge above E in UNITED. 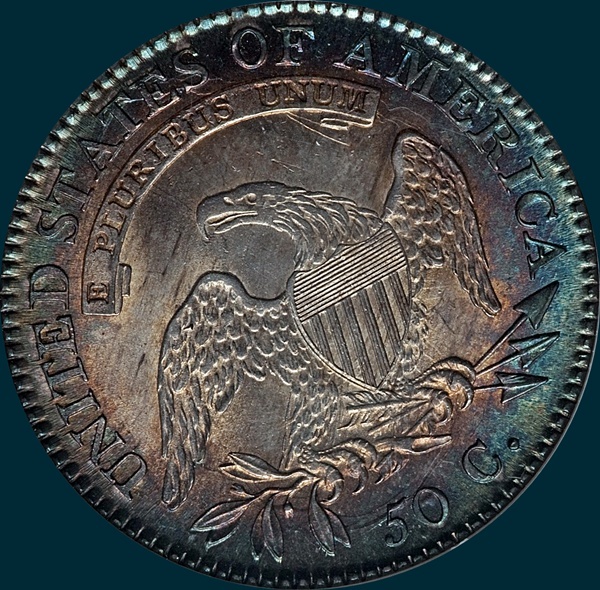 According to Edgar Souders, he estimates that the projected mintage for this overdate is approximately 93,505. Get his book Bust Half Fever and read all about overdates and how he came up with the number! This is one of the 1817's made from the Design 3 hub 1812-1817.